This drama promises to be yet another example of just how great Korean cinema is. Venerable director Lee Chang-dong is one of Korea's best filmmakers, and with actress Jeon Do-yeon leading the way, this has to be great. Korean cinema, oh how I love thee so. Sure, I love the subversive cinema coming from France these days and the great works of Danish filmmakers Lars Von Trier and Susanne Bier, but it seems as if each and every Korean director has something truly special to offer. 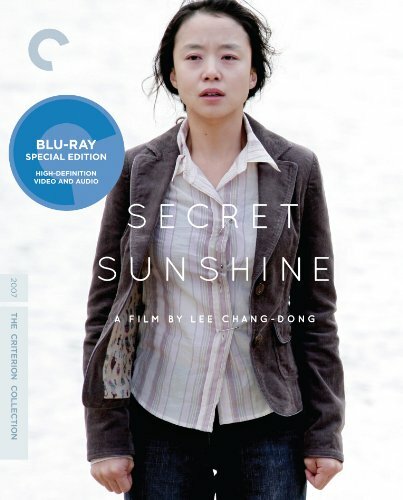 One glaring example is director Lee Chang-dong, the helmer of 2007�s Secret Sunshine (his latest effort, 2010�s Poetry is also new to Blu-ray), which is finally making its U.S. home video debut in the form of a stellar Blu-ray disc from The Criterion Collection. This brilliant look at the hardships of a young single mother garnered multiple international awards, (including the Best Actress award at the 2007 Cannes Film Festival for Jeon Do-yeon) and was also South Korea�s submission for the Best Foreign- Language Film Oscar. If you love Korean cinema like I do, there�s no question that Secret Sunshine should be the next movie you on Blu-ray. Shin-ae (Jeon Do-yeon) and her young son, Jun (Seon Jung-yeob) have packed up their things and are moving to the South Korean town of Miryang, where her recently-deceased husband grew up. Once there, Shin-ae sets up a small business where she teaches piano lessons to the town�s young people, with bigger aspirations to buy a larger piece of land. As she establishes herself in the town, she begins to realize how tight-knit and even religious that much of the small community is. Once an extremely tragic event occurs, Shin-ae is forced to cope by not only facing her previous disbelief in Christianity, but by potentially embracing such beliefs in order to continue living a meaningful life. Despite Lee Chang-dong's brilliant direction and a nearly flawless screenplay, it�s Do-yeon's performance that�s the real story. Her work here is simply unsurpassed, as she totally immerses herself in the ultra-challenging role of Shin-ae. What begins as the challenging-enough role of a single mother making a major life change for both herself and her son, evolves into something much darker, much more dynamic, and, fortunately, much more moving than expected. We�ve seen similar characters before but rarely have we seen anything approaching this particular type of performance (Bjork�s work in Dancer in the Dark is one of the few examples of something similar). The rest of the cast is brilliant as well, with the always-reliable Song Kang-ho (Thirst) giving an amusing and often at least semi-creepy turn as Jong Chan, a local mechanic who is instantly smitten with Shin-ae, although his end game with her is never truly apparent. Even more harrowing than the tragic turn of events that occur near the hour mark is the way the director treats them. As an audience, we�re left stunned at the brevity at which these events are treated. There�s a huge build up of suspense as we�re on the edge of our seats awaiting word on a key characters fate, when a scene is thrust upon us that is both heart-breaking and mesmerizing. The filmmaker�s genius lies in the way that the power of this scene doesn�t actually hit us until 2 scenes later. It�s during this sequence where we truly realize what has happened and are trying to piece together for ourselves (as is Shin-ae) as to what could possibly happen during the rest of the hour+ running time. It�s this kind of supremely challenging filmmaking that is sorely lacking in mainstream cinema, and the reason I (amongst many movie buffs) turn to foreign lands for truly thought-provoking, moving films like Secret Sunshine. Criterion�s Blu-ray disc is yet another impressive effort from the front-runner in Blu-ray distribution. The 1080p transfer is presented in a 2.35:1 aspect ratio and is virtually flawless, sporting crisp, detailed images throughout. Bright, vibrant colors are also a constant, as there is no edge enhancement or other flaws to drag this presentation down even the slightest bit. The Korean 5.1 DTS-HD Master Audio mix is also exceptional, thanks in large part to the crystal clear dialogue that dominates the film and blends in nicely with the rest of the track. We don�t get a large number of extras, but the ones that are here are more than worth a look. A nearly half-hour-long interview with director Lee Chang-dong is the best of the bunch as he provides some great insight into the themes he�s conveying in Secret Sunshine, and also talks in length about working with Jeon Do-yeon in such a challenging role. There�s also a short bit that includes on-set footage and interviews, the film�s theatrical trailer, and a great, illustrated booklet that gives us an even deeper look into the masterpiece in Korean cinema that is Secret Sunshine.